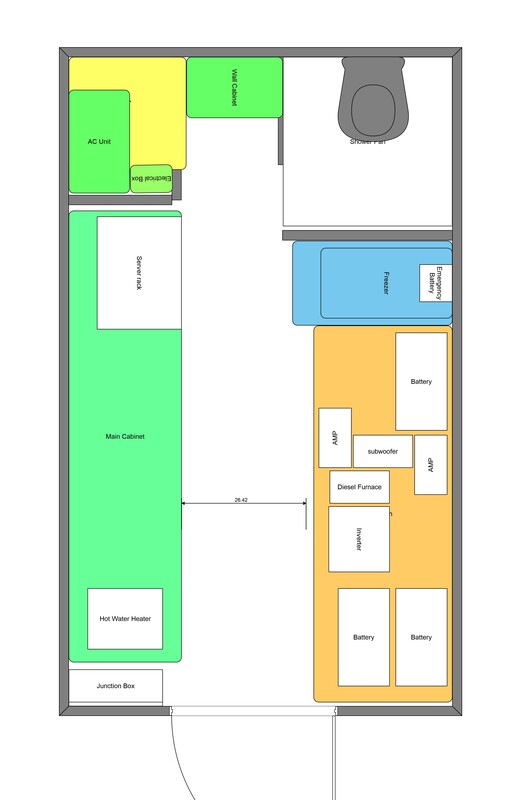 When it comes to the interior & exterior design of MogTug, it was an exercise in compromises and weighing all of the pros and cons, as it is for every builder. Whether it’s a house or truck. SyncroBo taught us that we like having a comfy interior, and I still marvel at the efficiency and effectives of the Westfalia approach. Our basic approach was to create a very comfortable interior in the box that focused n storage and working, a sleeping space on the cab, and most of living day to day would happen outside beside the truck. The Roof was pretty easy to layout. 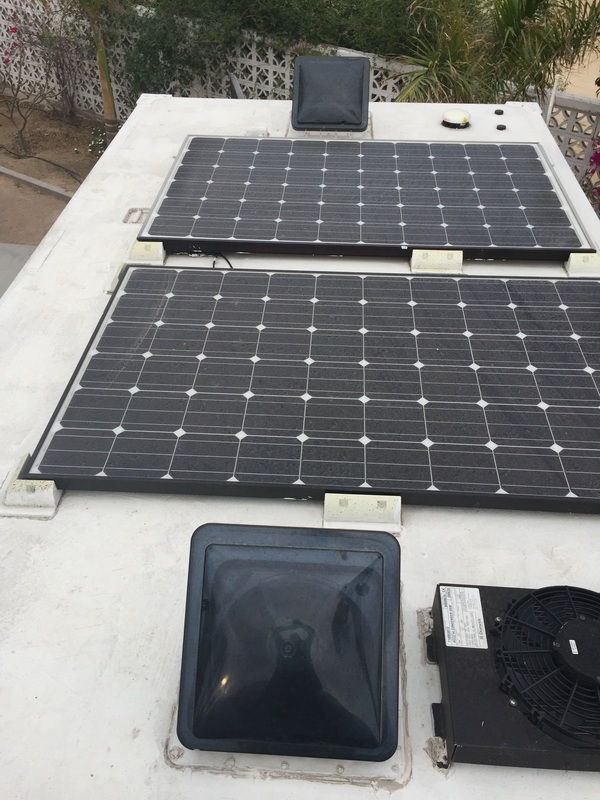 We knew from the beginning we wanted to bring as much solar power with us as possible, and we would have roof fans for ventilation and climate control. After measuring the box out, we found we could fit two large solar panels and two Fantastic Vents, so we could have one pull in and the other pull out, for great cross ventilation. We also knew we would be going for AC in the box, so once we narrowed down to a split system, we placed the other components on the roof. We slightly adjusted everything toward the diver side to give us a bit of a walkway on the passenger side of the roof, and also the driver would have a better view of upcoming obstructions on his side and naturally a better judge of potential contact. The roof was painted in a reflecting white coating, and it made a HUGE difference to the thermal loading of the interior vs. without it. We used a material that claims a 15-year life, and it can be painted over itself when it needs a recoat. This was definitely a great investment. Also, we mounted the solar panels with a small air gap beneath them, to allow better cooling of the panels for efficiency, but also to be a sort of tropical shade for the roof. Both of these approaches are highly recommended for builders. The interior presented more challenges in design. We had already committed to a set of cabinets and counter top and a couch before we left for Europe and those orders were now complete, even though we changed from the radio box. Luckily the new box is just a big rectangle, so it wasn’t hard to reuse them, but it more created a challenge with utilizing the left over space in this larger box. We contemplated a full time bed inside, but the couch we purchased was convertible to a bed, and we didn’t like using that much space inside the box. 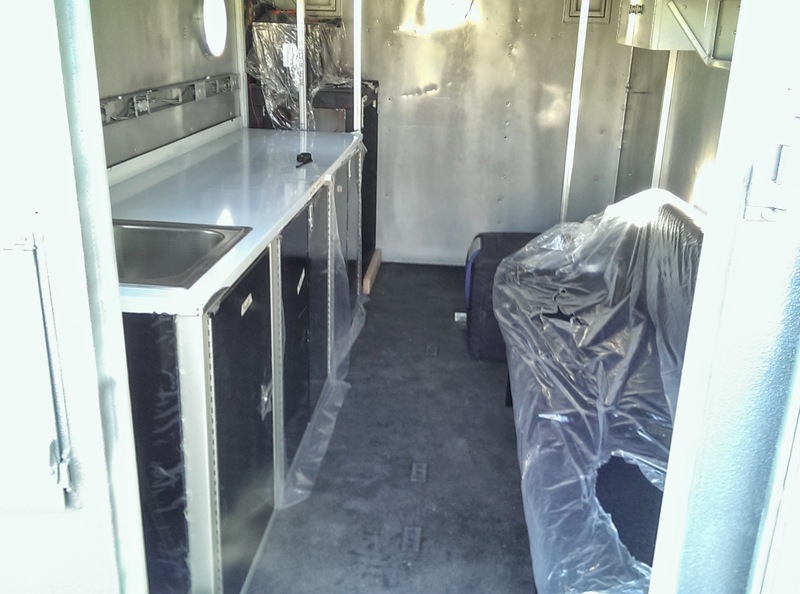 We contemplated a booth like most builds have, but again its a lot of fixed space, and we already had the couch. In the end we opted for a bathroom/ shower, and a utility area with a washer/dryer, oven, and the rest of the air conditioning components. We know many will question the choices, and we will explain them in greater detail when we break down each of the systems and rationale. But when we really looked back to our time in SyncroBo across the US, Europe, and beyond. The items we missed and spent a lot of time searching for were showers and laundry. 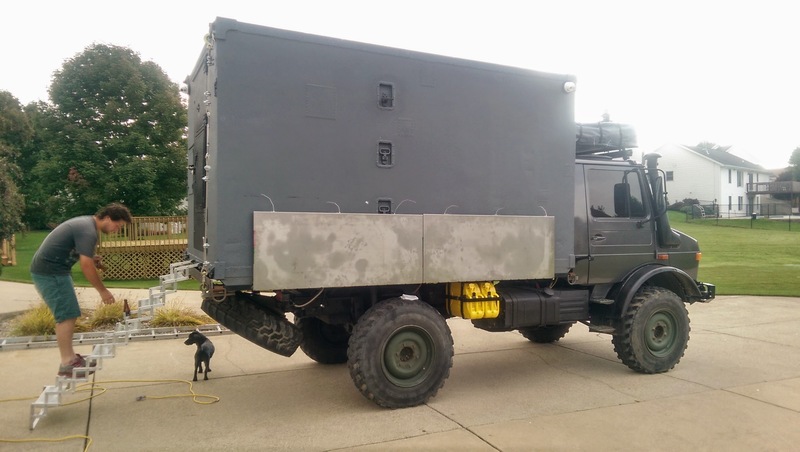 We have to live and WORK from this vehicle. We have to meet with organizations and present ourselves nicely on behalf of Filmmaker For A Cause (www.fmfac.org). If we didn’t need to work and it was more 6 months or less, I think it would be a different set of decisions. Having decided on no bed inside the box, we decided on a roof top tent for the main sleeping quarters over the cab. While the couch inside the box would be our emergency bunk with our two sleeping bags, we wanted something with more room for day to day living. Also, we liked the idea of maximizes all of the ‘planes’ of the vehicle to make them useful. 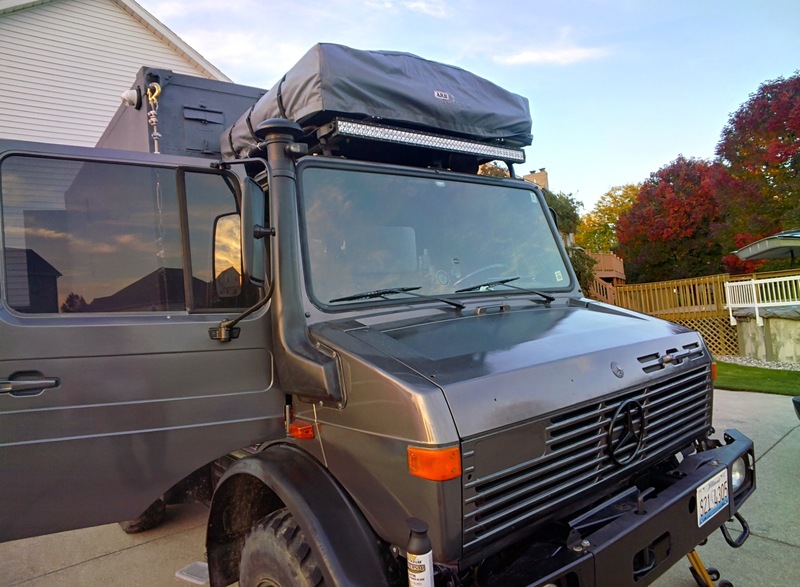 The truck came with a half roof rack, meant to mount a 50cal on it above the roof hatch in the cab, we repurposed that rack to make a full roof rack to support the roof top tent. It also, provided some small storage underneath for light items like small folding chairs and such. We were very conscious to not add too much to the roof rack, from a center of gravity perspective. We also decided to use the same rack as a means to mount our light bar. There will be a separate review about our selected roof top tent; ARB Simpson III as we are still formalizing our thoughts. One nice thing about a large vehicle is that you have a lot of space outside of the vehicle that you can use. From the beginning we always planned to do a lot of our living outside the vehicle. So we planned to make the passenger side of the vehicle the living room 🙂 of sorts. We put the awning on that side for shade. We made some folding stainless steel tables to have a work surface when cooking, prepping camera gear, etc. The back wall of the truck we consider our “tool shed”, we have the Aluminess Expedition Kit (http://www.aluminess.com/products-page/accessory/expedition-kit/), which we will cover later in a gear review, but its freaking awesome, our high lift jack, and the ramp for the motorcycle ramp. The chassis was another important area. 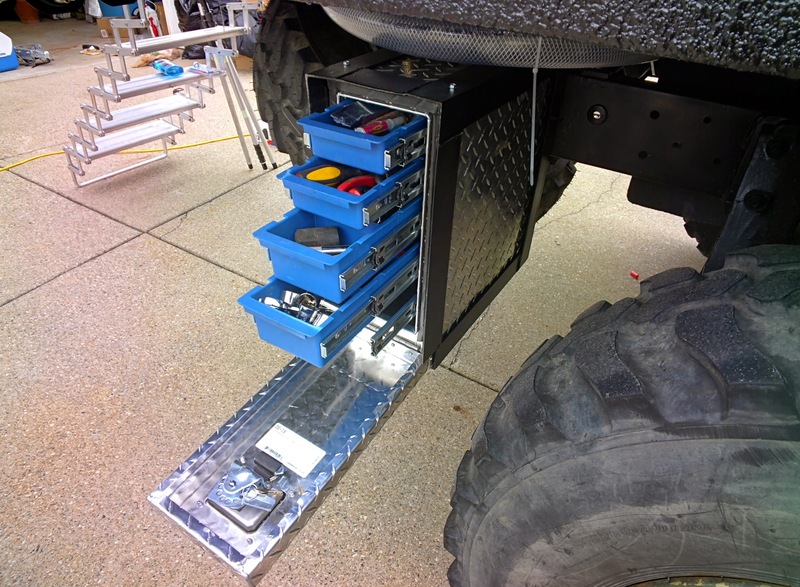 We tried to cleverly use the chassis space to create more living space inside the truck, also this would put weight lower on the truck and make it more stable when off canter. 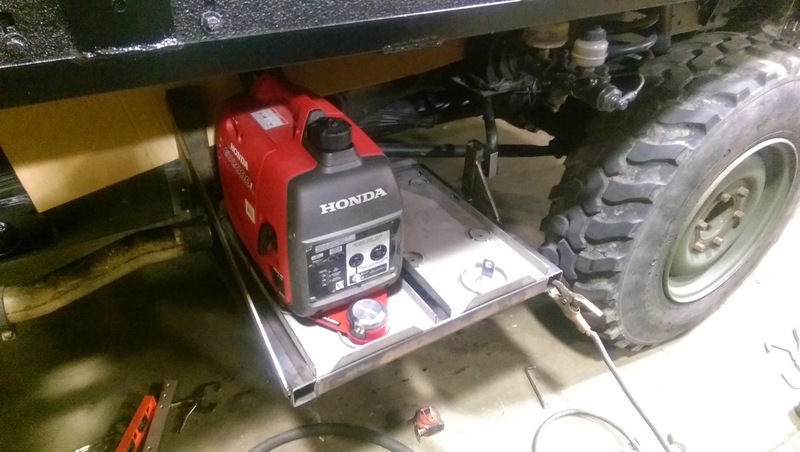 We reworked the exhaust to free up significant frame space on the driver side, and custom fabbed mounts for an aux fuel take, generators, storage boxes, and toolboxes. We will cover this more in the next post. But the idea was to move all heavy items outside of the living quarters, and low on the truck. 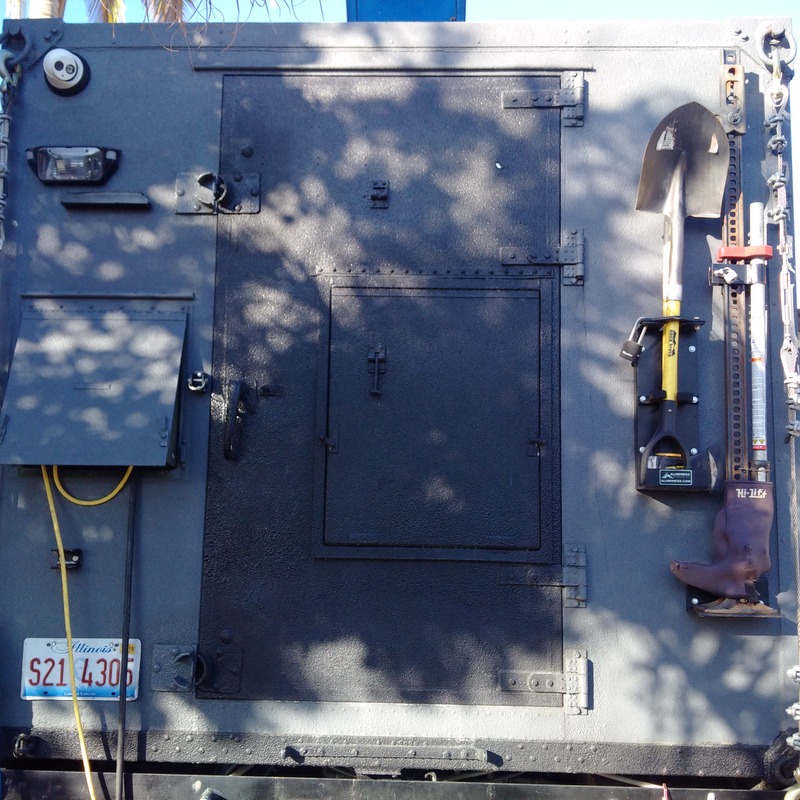 One thing you don’t see, and most people ask us about, when they see the truck, is windows on the camper box. On the driver side of the boxes, there are two windows that do open, but they are a pane to open, because they are more ports than hatches. We decided against traditional windows for a few reasons. First, was for security when shipping. 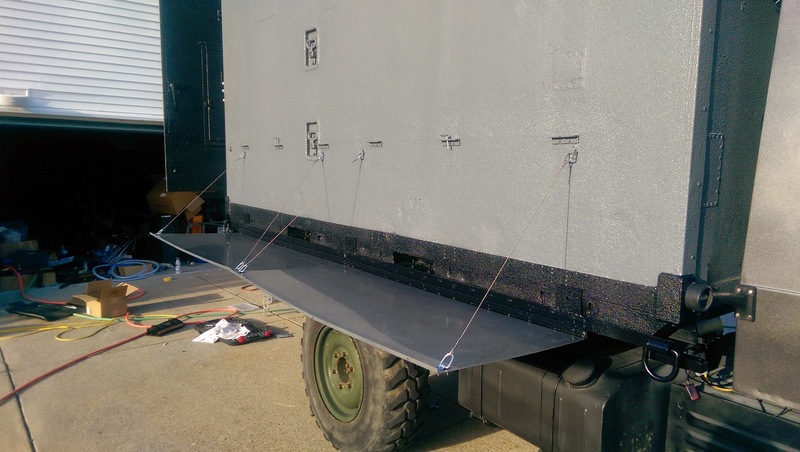 At our size, we are strictly RORO, and with our current design we can seal up the back of the truck very securely, and not have to worry about someone prying open a window. Secondly, we lived with the truck for a few months and we found that we didn’t miss the windows. We spend most of our time outside and thats how we like it. And lastly, its not dark inside the box. The roof vents are skylights and let in a ton of lights, and we have fully adjustable point and wide area led lighting in the box, so the box inside is nice. 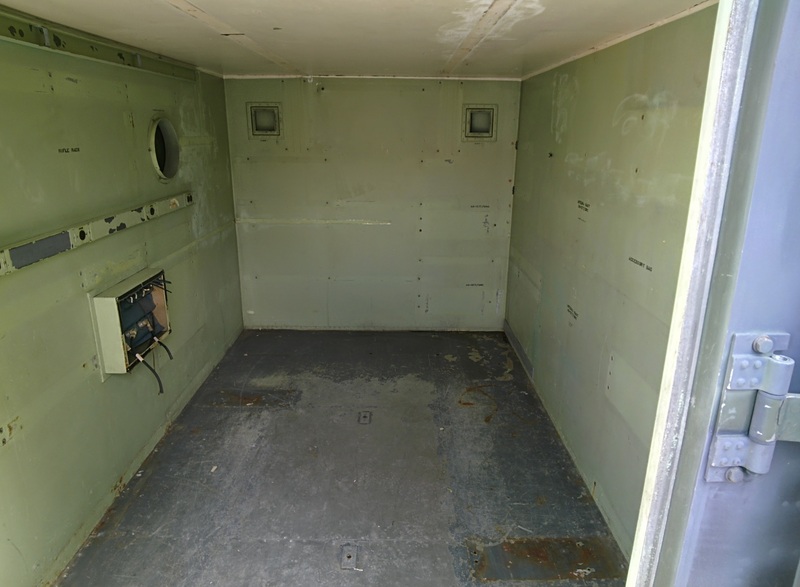 My dream would be to find a custom window maker, and make windows that can be fitted into the ports on the box, so when not RORO we can remove the cover and they are open and when RORO or in sketch places, you could batten down the hatches. Also make them electrochroamatic and i am in heaven.